We were having so much fun on this trip, the tour guide was so kind & nice. Go on an adventure you'll never forget with this one-day tour in Phuket that's sure to get your adrenaline pumping! 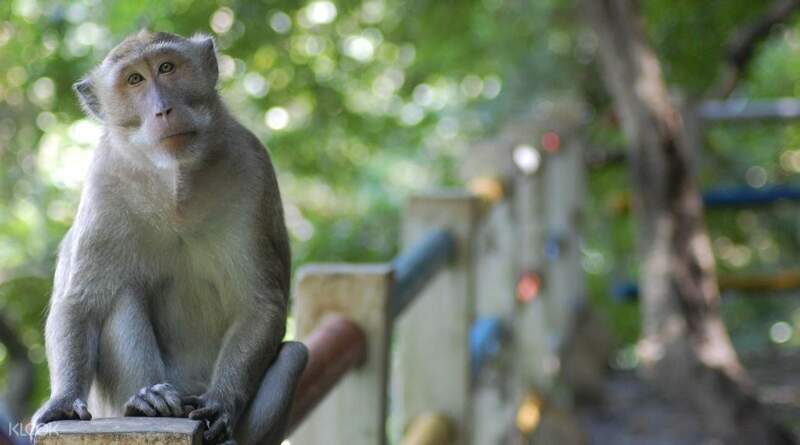 Get picked up at your hotel/accommodation in Phuket, then immediately head off to the first stop of the tour, Wat Suwan Kuha, a temple located inside Monkey Cave. Here you'll see various statues of Buddha and some artifacts from the past, as well as cute monkeys running around the cave to play. 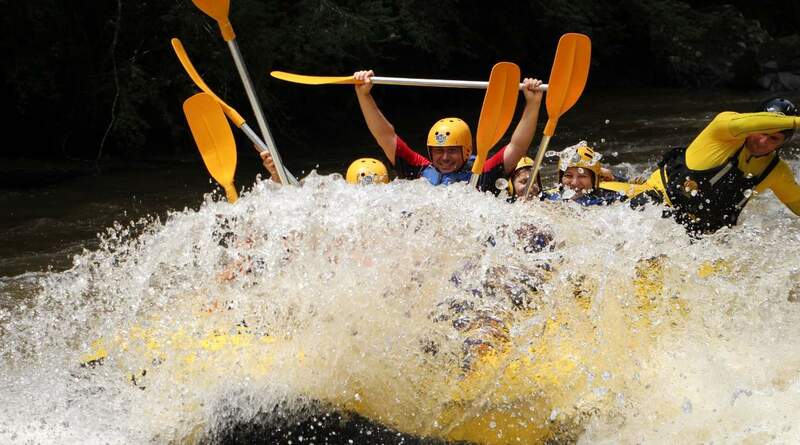 Head to a nearby river and enjoy a brief orientation on proper rafting techniques, before challenging yourself by working together with your group to reach the finish line 5 kilometers away. Relax and recharge after this energy-sapping activity with a delicious Thai lunch at a camp beside the river, where you'll also get to indulge yourself with some fresh fruit, aromatic tea, and flavorful coffee. 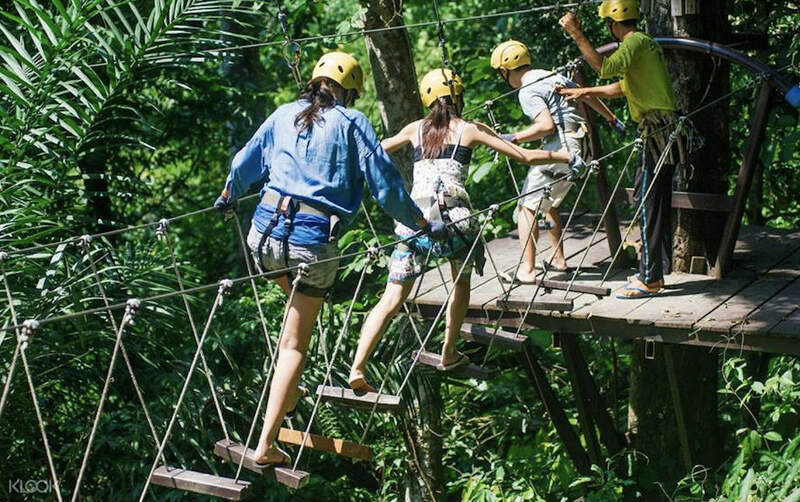 Get an unbeatable birds'-eye view of the surrounding greenery of the forest as you go ziplining through 5 different platforms, feeling the warm sun and the cool breeze on your skin as you fly in-between the trees. You'll also get to walk on a bridge suspended at 11-meters high for the thrill of a lifetime! Head back to the ground and walk through the forest as you make your way to Ton Pariwat Waterfall, where you'll get to cool off in its pristine, crystal-clear waters. Head back to camp and either drink some more coffee or tea, or use the camp's herbal steam room, before you start to pack up and head back to the city. 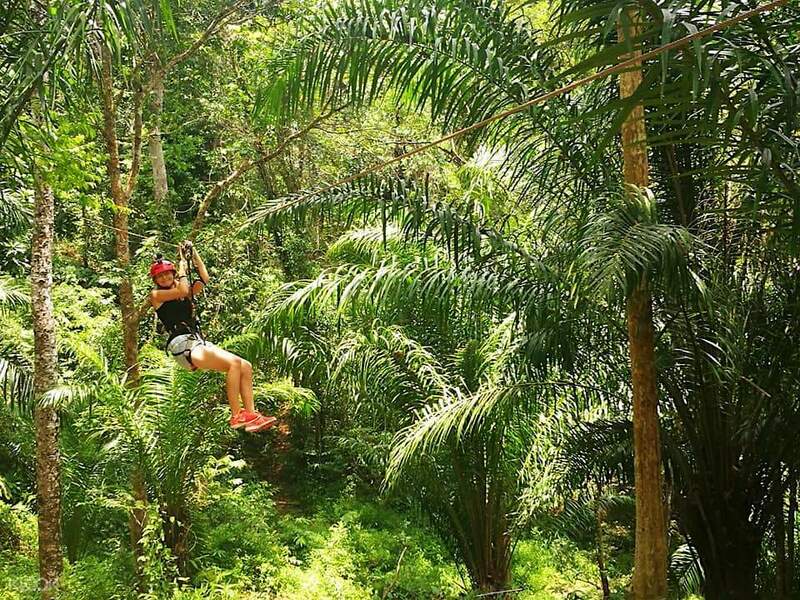 Get an unbeatable view of the surrounding natural beauty by flying in the air on five different zipline platforms! The tour was amazing. The rafting could have gone smoother if not for the dry season so they had to release water from the dam. I would recommend doing the rafting during wet season. There were 6 of us in the boat, 2 of which are staff members. Also nice that we got to paddle unlike the other boats we saw, from other tour agencies. Would recommend to anyone looking for something thrilling. The tour was amazing. The rafting could have gone smoother if not for the dry season so they had to release water from the dam. I would recommend doing the rafting during wet season. There were 6 of us in the boat, 2 of which are staff members. Also nice that we got to paddle unlike the other boats we saw, from other tour agencies. Would recommend to anyone looking for something thrilling. What a beautiful day! We were only 2 participants with two really professional guides: Matt and Lénar! All the team members are great(tremendous), thanks to you for your kindness. Very atypical temple with at the exit some very friendly monkeys that you can feed, a romantic meal very well served with 7 different dishes, a delight! Then the rafting, the original one. We were accompanied with 3 members of the staff. There was a some people from the other companies in the descent, we laughed well. Then zip line, very nice, everything in safety. A very nice waterfall, we were just the two of us with many fishes. Good moment of tranquillity ! We finished with a sauna in herbs and some refreshments. What a beautiful day! We were only 2 participants with two really professional guides: Matt and Lénar! All the team members are great(tremendous), thanks to you for your kindness. Very atypical temple with at the exit some very friendly monkeys that you can feed, a romantic meal very well served with 7 different dishes, a delight! Then the rafting, the original one. We were accompanied with 3 members of the staff. There was a some people from the other companies in the descent, we laughed well. Then zip line, very nice, everything in safety. A very nice waterfall, we were just the two of us with many fishes. Good moment of tranquillity ! We finished with a sauna in herbs and some refreshments. It’s a new experience to raft under the rain. Super thrilling and fun ! Everybody should try ! Money well spend ! It’s a new experience to raft under the rain. Super thrilling and fun ! Everybody should try ! Money well spend ! Pick up was on time and I enjoyed the activities. The only downside was that we didn't know that the ride would take that long and there were three groups doing different activities in the same van. So there's a little bit of waiting around. Pick up was on time and I enjoyed the activities. The only downside was that we didn't know that the ride would take that long and there were three groups doing different activities in the same van. So there's a little bit of waiting around. extremely fun and exciting. very tiring but worth it. be careful if bringing elderly or very young kids. extremely fun and exciting. very tiring but worth it. be careful if bringing elderly or very young kids. Overall it was good although we had to miss one of my attractions because the driver said we wouldn’t have time yet we finished all the others and had four hours to spare as I booked a twelve hour charter. After the last one the driver wanted to take me back to the hotel but I wanted to see a bit more when I asked for recommendation he said everything is closing as it was five o’clock so I asked for to go to a market he seemed frustrated but took me to me to a shopping centre. Throughout it all he was polite and courteous all be it through gritted teeth nearer the end but it had been a long day. I would recommend this but only the six or eight hour. Overall it was good although we had to miss one of my attractions because the driver said we wouldn’t have time yet we finished all the others and had four hours to spare as I booked a twelve hour charter. After the last one the driver wanted to take me back to the hotel but I wanted to see a bit more when I asked for recommendation he said everything is closing as it was five o’clock so I asked for to go to a market he seemed frustrated but took me to me to a shopping centre. Throughout it all he was polite and courteous all be it through gritted teeth nearer the end but it had been a long day. I would recommend this but only the six or eight hour. very grateful experience everything went well from getting picked up to the whole day adventure. All the staff were excellent this adventure I will never forget. I highly recommend this adventure tour to everyone all my group enjoyed it. the Zipline was very fun and the white water rafting was the best experience i have ever had. very grateful experience everything went well from getting picked up to the whole day adventure. All the staff were excellent this adventure I will never forget. I highly recommend this adventure tour to everyone all my group enjoyed it. the Zipline was very fun and the white water rafting was the best experience i have ever had. A super adventure activities recommended for all. I love the rafting the most with those great guides. All arrangements and pick ups done effectively and on time. A super adventure activities recommended for all. I love the rafting the most with those great guides. All arrangements and pick ups done effectively and on time. pickup was on time and overall a smooth journey. the water rafting team was very experienced in their work and took care of us well! although they overlooked my friend’s dietary requirement the kitchen whipped up new dishes for her on the spot. zipline was a tad underwhelming and there was no 11 meter sky bridge but we enjoyed ourselves in the end! The best part was the waterfall imo, with the cool water and chill environment. pickup was on time and overall a smooth journey. 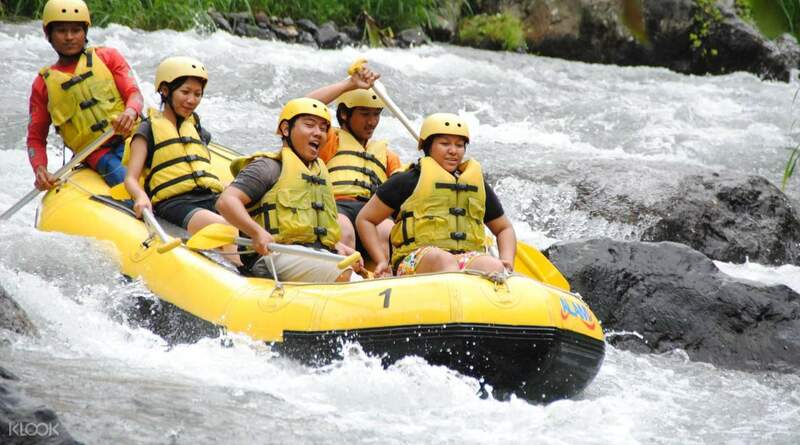 the water rafting team was very experienced in their work and took care of us well! although they overlooked my friend’s dietary requirement the kitchen whipped up new dishes for her on the spot. zipline was a tad underwhelming and there was no 11 meter sky bridge but we enjoyed ourselves in the end! The best part was the waterfall imo, with the cool water and chill environment.